We select magnetic shielding materials for their specific characteristics, usually with respect to permeability and saturation. Permeability determines the effectiveness with which a given shield can entrap magnetic flux by offering it a low reluctance path. Saturation determines the maximum flux density that a given shield can entrap based on its thickness and the intensity of the magnetic field. It is important to remember that permeability and saturation are inversely related. As permeability values increase, saturation levels decrease. This means that the highest permeability alloys such as Amumetal have the lowest saturation values. Because a saturated shield is a poor attenuator, it is important to select materials with adequate saturation characteristics to withstand the strength of a given source field while still providing the required attenuation of that field. Understanding the characteristics and trade-offs of our standard magnetic shielding materials is also important because materials are often the greatest driver of a shield’s overall cost. Today, most magnetic shields made are constructed from high permeability materials such as Amumetal, an 80% Nickel-Iron alloy designed especially for magnetic shielding applications. This high Nickel-content alloy conforms to MIL-N-14411C, Composition 1 and ASTM A753-85, Type 4. Amumetal is available in the following standard thicknesses in a maximum sheet size of 30.00″ x 120.00″. We can generally cut, size, and ship our standard thicknesses to your site within 2 to 3 days of your request. Amumetal 4K (A4K) is our proprietary cryogenic high Nickel content alloy that yields increasing permeabilities with decreasing temperatures. Through our proprietary Hydrogen annealing cycles, this material can be optimized for use at 77˚K or 4˚K and below. A4K is available in .020″, .040″ and .062″ thicknesses and in sheets up to 24″ wide and 120″ long. Amunickel is a medium permeability material providing greater saturation protection than Amumetal. Amunickel is a 48% Nickel-Iron alloy that conforms to MIL-N-14411C, Composition III. It should be used in applications where saturation is as great a concern as permeability. Amunickel is available in the same thicknesses as Amumetal but with a maximum width of 16.00″. Cryoperm 10 is a high Nickel-content alloy that is specially processed to yield increasing permeabilities with decreasing temperatures. This material, depending on proprietary Hydrogen Annealing cycles, is designed for use at either 4.2K or 77.3K, making it the ideal material for use in cryogenic applications. Cryoperm 10 is available in .020″ thickness and in sheets up to 10.23″ wide. Amuneal offers a complete line of high performance shielding foils uniquely processed for applications where weight, space, complex geometry, and performance are of primary concern. These foil materials are available in the identical chemical compositions and shielding characteristics as our Amumetal, Amunickel, and Ultra Low Carbon Steel (ULCS) materials. Each of our shielding foils is available in a standard thickness of .002″, .004″, .006″, and .010″ and can be supplied in coil, strip, or fabricated pieces in widths up to 24.00″. This material, like our sheet material, can be Hydrogen Annealed to achieve optimum magnetic shielding characteristics. In addition, Amuneal can laminate our foils with double-backed adhesives and dielectric insulators to produce complete stamped components in small to very large volumes. These laminated foils are perfect for applications where a thin shield needs to be permanently affixed to a particular component or area. 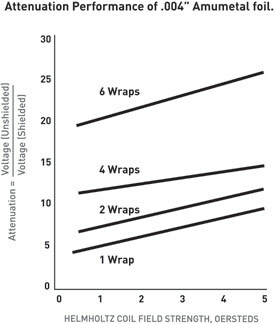 The chart below illustrates how shielding performance increases with each successive layer of foil. Amuneal’s specially processed, Ultra Low Carbon Steel has a relatively high permeability and excellent saturation characteristics when compared to standard low carbon steels. This material is less brittle and easier to form than silicon steels, which allows it to be easily fabricated and installed in large area shielding projects. ULCS can be used together with high permeability materials like Amumetal to create optimum shields for applications requiring both high saturation protection and high levels of attenuation. *Information for Cryoperm 10 is based on its use at Cryogenic temperatures. Cryoperm 10 is a registered trademark of Vacuumschmelze GmbH, Hanau, Germany. The following chart compares the physical properties of Amuneal’s standard shielding materials. Each provides the required material characteristics for different applications.